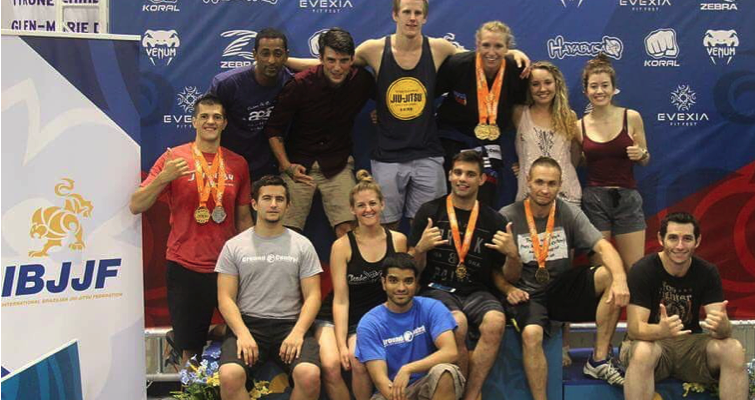 Ground Control Columbia sent 14 competitors up to the IBJJF New York Summer Open. The two day event took place on July 16th and 17th. The event kicked off on Saturday with the gi divisions and carried over into the following day. Sunday, July 17th, was the start of the NoGi bracket. Many of the students who fought over the weekend, were first timers who had not competed in Brazilian Jiu Jitsu before. Ground Control Columbia walked away from the event with 10 medals, matching their medal count from the IBJJF New York Spring Open back in April. Schyler Sootho fought through a very technical striking affair with opponent Paul Rath, en-route to a decision loss. Schyler had to battle through breaking his hand in the second round after connecting with a straight right. It was believed that Schyler had done enough to win the fight. He had his opponent missing strikes for most of the night, only accumulating inside leg kicks and scoring a late takedown in the third round. Schyler was able to land straight punches and lead body kicks throughout the night while keeping his distance to avoid Paul’s exchanges. The only time the fight hit the mats, was with 20 second left in the third round. His opponent was able to close the distance on the cage and work for a takedown. This resulted in Paul taking Schyler’s back with little time left on the clock. One judge had scored the fight 30-27 for Schyler, winning all three rounds; while the other two judges had scored it 29-28, two rounds to one, for his opponent.